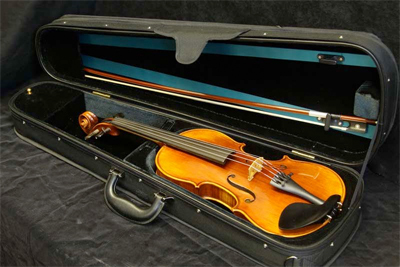 Student String Instruments | Morey's Music Store Inc.
Morey’s Music Store is proud to offer quality, affordable violin outfits in a variety of price ranges starting at just $489.00. Each outfit includes violin, case and bow. 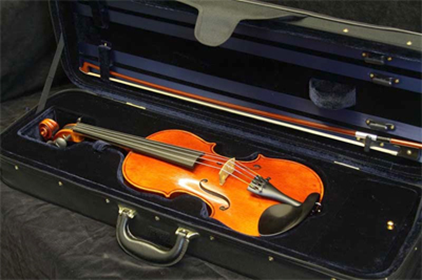 For new string players check out this link: advice on selecting a beginning string instrument. The H.K. 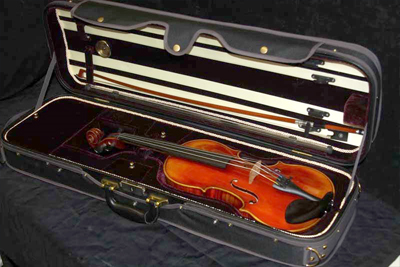 Schmidt Model 400 is a completely hand carved instrument with real inlaid purfling. This violin comes with a hand-cut bridge and soudpost. The pegs and fingerboard are ebony and the strings are D’Addario Pro-Arte or Pirastro Tonica. This outfit includes a quality case and a wood bow with real horse hair and an ebony frog. This outfit sells for $489.00 and includes a lifetime warranty for the structural integrity of the instrument and a guaranteed 80% trade-in if returned in like condition. As a teacher, I know that when I send my private students there, they will be treated with kindness, respect, and be offered quality products at reasonable prices… The quality of the instrument setups, even in the student-level rentals are world-class. 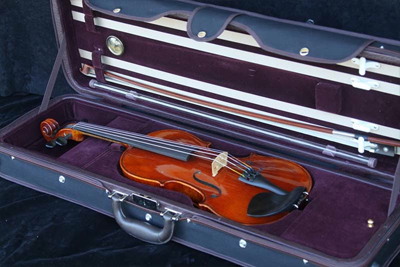 The model 500 is our number one selling violin outfit. It features seasoned, hand carved maple back, ribs and neck and a hand carved, graduated spruce top. Each instrument is expertly set up with a hand cut bridge and soundpost. The pegs and fingerboard are ebony and the instrument comes strung with Dominat or Vision strings. The outfit includes a bow and oblong violin case. The Model 700 has all of the features of the Model 500 but has a more highly-figured maple back and sides and is more refined in its craftsmanship. In addition it comes with an upgraded brazilwood or carbon fiber bow. The Model 800 is the most refined of the Franz Junger instruments and each comes with a beautiful highly figured one or two-piece maple back. The varnish is shaded and slightly antiqued. Like the other models, each instrument comes with a hand cut bridge and sound post a hand planed fingerboard and quality Dominant brand strings. This outfit includes a deluxe brazilwood bow. These instruments have a beautiful warm tone.